Overport Lodge filly Millwood Tilly, by three-time NZ Cup champion Terror To Love (1:51), and the first foal from eight-win mare Albuquerque (1:58.1), showed smart speed in her 1:57 (1609m) Ashburton qualifier on Tuesday. Driven by Sheree Tomlinson, she set a busy clip throughout the two-year-old fillies heat, only being caught late by close relative, the previously qualified Miss Ruby Sunshine. The Mark Smolenski-trained Miss Ruby Sunshine, who qualified at Rangiora on January 15, is by Sunshine Beach (1:47.4) from Albuquerque’s half-sister Miss Sunshine, the one-win McArdle dam of fast Menangle winner Mattgregor (1:50.6, 15 wins & $136,666) and minor NZ winner, Miss Ethel Sunshine (1:59.4). Miss Ruby Sunshine settled back but stormed home to win by a length in 1:56.9, despite the leaders last 800m in 56.2s and final 400m in 26.8s. Millwood Tilly, and Sheree Tomlinson, lead She’s A Rebel into the first turn in their Ashburton 2YO Fillies trial. Millwood Tilly held second, a length and a quarter clear of the Malcolm Shinn-trained Narcissit (Bettarthancheddar-Susie Maguire), who trailed for John Morrison, with the Cran Dalgety-trained She’s A Rebel (Bettor’s Delight-Highview Chasue) next for Alana Cameron. Close relatives, Miss Rebel Sunshine and Millwood Tilly, have plenty of big-winning relatives. Millwood Tilly’s dam Albuquerque was prepared by Graham Pearson, who enjoyed a couple of decades of good success with this family. Albuquerque is a Bettor’s Delight sister to big NZ, Australian and USA winner Alberto Contador (1:49.8, 44 wins & $664,218), and also a sister to Duke Of Albany (1:54.4, 12 wins & $82,977). Millwood Tilly’s grand-dam Princess Alberta (by Albert Albert) won six including a Nevele R Fillies Consolation and was the runner-up in a Great Northern Breeders 4YO Stakes. Her fourth dam Catarina showed smart early promise for Pearson, winning twice before injury ended her race career. At stud, she left six individual winners including Star Drifter (1:52.8, US; 15 wins & $172,737) and Ismay, the one-win dam of star performer Oaxaca Lass (p3, 1:55.8, 19 wins & $456,134), winner of the 2002 NZ Sires Stakes 3YO Fillies Final, Queensland Derby, Australian Oaks and 2003 Chariots Of Fire 4YO, when prepared by Neil Hamilton for Mr Pearson. Oaxaca Lass is a sister to another hardy performer in Another Homer (1:52.2, US), who won six in NZ including the 2010 Roxburgh and Nelson Winter Cups, when prepared by Robbie Holmes for Mr Pearson. 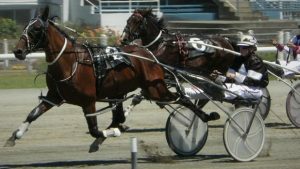 Oaxaca Lass (by Holmes Hanover) has bred on, leaving 10 individual winners including Condrieu (1:51.5, Aust, 22 wins & $269,520); Weka Lass (six-wins) Meursault (three wins); Kusadasi (three wins); Intrepid Traveller (1:54.8, 16 wins & $81,857); Illegal Immigrant (1:55.2, 12 wins & $82,963), former Overport Lodge mare, Senorita Margarita (1:58.6, four wins); and recently exported mutliple Addington winner, Acuto (1:56.7, five wins), formerly trained for Mr Pearson by Brendon Hill. Two daughters of Oaxaca Lass have also made their mark as broodmares, with Weka Pass leaving former useful south winner Reciprocity (1:55.1, Aust, 11 wins & $77,160), Shes Got Issues (1:58.3, eight Aust wins) and Sally Maclennane (1:59.3, three wins); and Kusadasi leaving Kardesler (1:56.1, four wins).